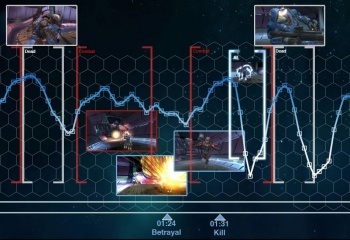 Did you ever wonder how your heartbeat rate changes during a match of an online game like Halo? Playing competitively online - whether it's a shooter like Battlefield or a strategy game like StarCraft II - can be an intense affair as you try to frantically dispatch your enemies before they do the same to you. I know that personally, I've come out of a decisive battle in SC2 or TF2 with my heart racing, and I suspect many gamers would report similar experiences in pretty much any game they play. One Reddit user decided to test that. According to the post on Reddit, the user - who goes by "gortag" - hooked himself up to a heart monitor as he played a round of Halo: Reach. Afterwards, he looked at the replay and matched the spikes and valleys with significant moments in the game. The resulting graph is actually pretty damn fascinating. Some parts of it are to be expected; it only makes sense that your heartbeat would pick up in a fire fight. Others, however, are surprising: Every time the player uses Armor Lock (which makes you completely invulnerable for a short period of time at the cost of mobility) his heart rate plummets. Presumably, you would only use AL when you were in combat and in need of it - do a few moments of invincibility really calm a player down that much? Either way, it really is food for thought. Check out the full (large) image here!